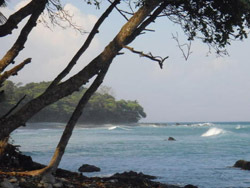 Matapalo is located on the southern most tip of the Osa Peninsula known for incredible surfing. Secluded, private and pristine are some the things that come to mind in thinking of Matapalo. There are some all-inclusive hotels and resorts in the area. Not the easiest place to reach, a 45 minute drive from Puerto Jimenez, an 11 hour drive from San Jose, will be worth the trip because the scenery along the way is spectacular.